Mumbai stampede: Angry relatives of the victims termed the hospital's decision as "insensitive". 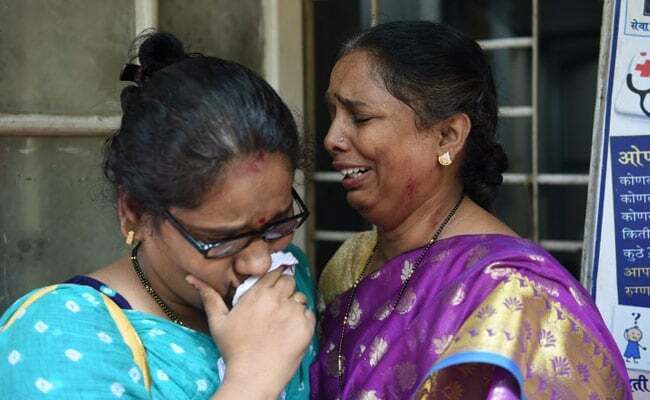 Mumbai: A group of Shiv Sena workers barged in to Mumbai's KEM Hospital on Saturday and allegedly assaulted a senior doctor for marking of bodies of the Elphinstone Road station stampede victims, police said. They overpowered him and tried to scribble on his forehead last evening, a senior police officer said. The men claimed that the hospital had disrespected the departed by writing numbers on their foreheads. Dr Harish Pathak was in his office when five to six men allegedly attacked him. The accused have been detained and a case has been registered, the police said. The authorities at the KEM Hospital were criticised for marking the victims' bodies and putting their photographs on display. Angry relatives termed the hospital's decision as "insensitive". However, the management clarified that "it was a scientific measure" which was "taken to ease the process of identification and avoid chaos". "We didn't intend to hurt anybody's sentiments," the hospital's statement said. Dr Pathak said it is "unjustified and unwise" to criticise the method. "It would have been a big mental trauma to make the relatives see all the bodies for identification," he said. The numbers were erased after the autopsies, he added. The stampede, which killed 23 and injured over 30, took place around 10.30 am on Friday, when four trains rolled in at the same time prompting the crowd on the narrow foot overbridge to make a dash. The decades-old bridge was already crammed with people taking shelter from heavy downpour. A few commuters slipped, and fell on others amid reports of a short-circuit that spread panic. Railways Minister Piyush Goyal yesterday held meetings with top officials and directed them to ensure safety of the commuters. He also promised to get escalators installed at crowded stations and CCTV cameras in local trains. "Every commuter of Mumbai Suburban is as important as a Rajdhani passenger and should be treated like one," he added.